We celebrated the 40th anniversary of their championship during their recent renunion. 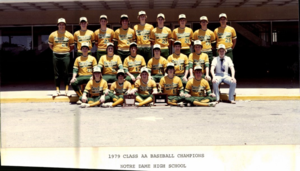 We are proud of our '79 State Champion Baseball Team! That team won Notre Dame's one and only state championship. The team recently got together to recreate their team photo. Take a look! 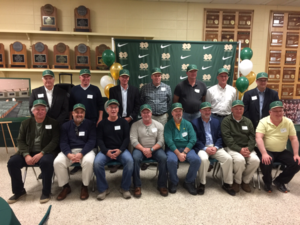 Front (l-r) - Barry Courter, Charlie Cooper, Robert Kosky, Chuck Carter, Brian MacDougal, Ed Fisher, David Sorrick, Mark Gang.